The tenth edition of Young Investigators’ Meeting (YIM) was held in Thiruvananthapuram from March 5 to March 8, 2018. Being the tenth year, this year’s YIM was structured on a different format and brought participants from all the previous YIMs under one roof for the entire duration of the meeting. 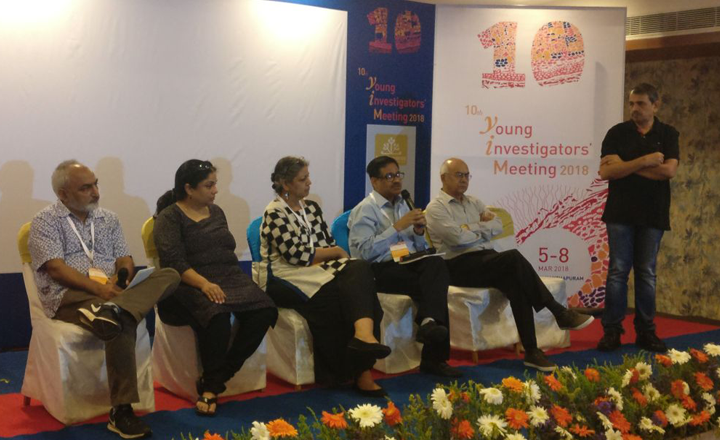 The key feature of this year’s YIM were the four breakout sessions, where scientists debated on four themes– 1) Best practices for recruitment and mentoring of YIs in India, 2) Sharing resources and collaborations, 3) PhD and postdoctoral training in India and 4)Future of biology research in India. Mayor’s talk was followed by Ron Vale’s keynote lecture. Vale, a professor at University of California, San Francisco was on a sabbatical at NCBS Bangalore, when the idea of organising a YIM-like meeting, first occurred to him. In the 10 years hence, the meeting has gone from strength to strength and has helped build a connected community of Indian biologists. He insisted repeatedly that Indian biologists should steer clear of the ways in which research is practised in the US and instead create systems that allow research to thrive in India and draw focus on on societal challenges unique to India. Second keynote was delivered by K VijayRaghavan of NCBS who was also recently nominated as the Principal Scientific Advisor to the Government of India. He said that science and technology are the solution to problems of scale that are abundant in India. He acknowledged the gap that divides politics and science in India and hoped that with better communication and ingenuity from scientists, this gap will be filled. Day 2 at YIM began with a talk on the whys and hows of science outreach by L S Shashidhara of IISER, Pune. This was followed by a talk from Smita Jain of IndiaBioscience, who explained to the young researchers the various ways in which they can engage with the IndiaBioscience website. There were talks from young researchers working in areas of biology as diverse as molecular biology, biophysics, ecology and evolution. However, the highlight of the day were the breakout sessions. The first session on– best practices for recruitment and mentoring of YIs in India. The participating scientists were divided into groups of 10 -12 and each group discussed the challenges in face of good recruitment practices and factors determining future promotions. The points discussed during this breakout session were compiled and presented to the audience by Thomas Pucadyil of IISER, Pune who was also the leader for this theme.The scientists were all in agreement that the recruitment process should be made more transparent and that a scientist’s success should not be measured in terms of number and impact factor of their publications. The breakout session was followed by a special talk by Shinjini Bhatnagar of THSTI and Satyajit Rath of Agharkar Research Institute on bridging the gap between scientific evidence and policymaking. In the second breakout session of the day, the young researchers split into groups again, to discuss how sharing resources and collaborations can improve science and what stops young scientists from collaborating. The researchers felt that it is often quite hard to assess a researcher’s contribution in a collaborative project and therefore a clearly defined methodology to assess researcher contribution is needed. There was a general consensus about promoting collaborations and that it should be encouraged even in younger researchers doing PhD or postdoc. There were also suggestions about setting up state of the art regional technical facilities that can be used by any researcher interested in doing so. The discussions on this theme were collated and presented by Roop Mallik of TIFR, Bombay who was the leader for this theme. Day 3 saw a series of talks by young researchers on translatable research, tumour biology and plant defense mechanisms. A special session was organised to address challenges related to funding. This session started with a talk by Arabinda Mitra of DST. He spoke about the multiple international partnerships that the government has started and how these partnerships will allow for exchange of scientific ideas. There was another talk by Barbara Pauly of Human Frontier Science Program (HFSP)who said that her organisation is looking to fund bold and audacious projects in interdisciplinary science involving multi-country partnerships. A panel discussion was also organised to address the challenges faced by young researchers in getting funded. The panelists were, Meenakshi Munshi and Suman Govil of DBT, Arabinda Mitra of DST and Vandana Gambhir of IISER, Pune. The discussions were led and moderated by Shahid Jameel of India Alliance. Munshi insisted that scientists must follow the directives of their sanction orders diligently and initiate a dialogue with the funding agency in case of any problems. Right after the panel discussion was a talk by Savita Ayyar, who is a Research Management Consultant. She spoke about the Indian Research Management Initiative (IRMI) that she is developing in partnership with India Alliance, to help Indian research institutes put in place better practices of research management. The focus for Day 3’s breakout session was PhD and postdoctoral training in India. Most participants agreed that the both PhD and postdoctoral training in India require some radical changes. Those doing PhD and Postdoc in India should be empowered, offered quality mentorship and made aware of the various kinds of job opportunities.The discussions on this theme were presented by the theme leader Sachin Kotak, who is from IISc. Day 3 ended with a special talk by Subhash Lakhotia of BHU about the history and future biological research in India. The fourth and last day of YIM started with talks from young investigators. It was followed by an impromptu session on women in science where young scientists discussed some of the problems faced by women scientists. A panel discussion on effective science communication was also organised on the last day. The panelists for this session included, Dinakar Salunke of ICGEB, Dhrubajyoti Chattopadhyay of Amity University, Rakesh Mishra and Jyotsana Dhawan of CCMB and Shubha Tole of TIFR. The discussions were moderated by L S Shashidhara of IISER, Pune. All panelists agreed, that in communicating their science, scientists should not worry about the journal’s impact factor. “Instead think about the audience of the journal you are going to publish in. Choose a journal which is read by the people whom you would like to know about your work”, suggested Salunke.Another important point discussed, was making use of pre-print archives. It helps avoid any authorship-related conflicts and also allows scientists to share and get feedback on their work from their colleagues. For the breakout session was on Day 4, scientists discussed the future of biological sciences in India. Some facts that emerged from this breakout session were– universities should have better access to infrastructure, both applied and basic research should be encouraged, with curiosity being the main driver of research, young students should be free to study any combination of subjects as it will foster interdisciplinarity. The leader for this theme was Rashna Bhandari of CDFD. The last discussion of the day was on the role of YIM and IndiaBioscience in the coming years. There was a unanimous consensus that YIMs should continue. There were also suggestions about what IndiaBioscience can do for the community, like creating an online database of PDFs looking for jobs, organising meetings for institute directors and organising sessions on industry-academia collaborations, science communication and patenting. The discussions made way for the final event of the day, the poster session. Like all previous days, after the talks ended, the participants showcased their work via poster presentations. On each day, the poster arena saw the scientists engaging in many lively discussion, both formal and informal. For most participants the breakout sessions and the opportunity to network with their peers was the best part of the meeting. Plans for regional chapters of YIM were made and the outcomes from each breakout session are being compiled into white papers.